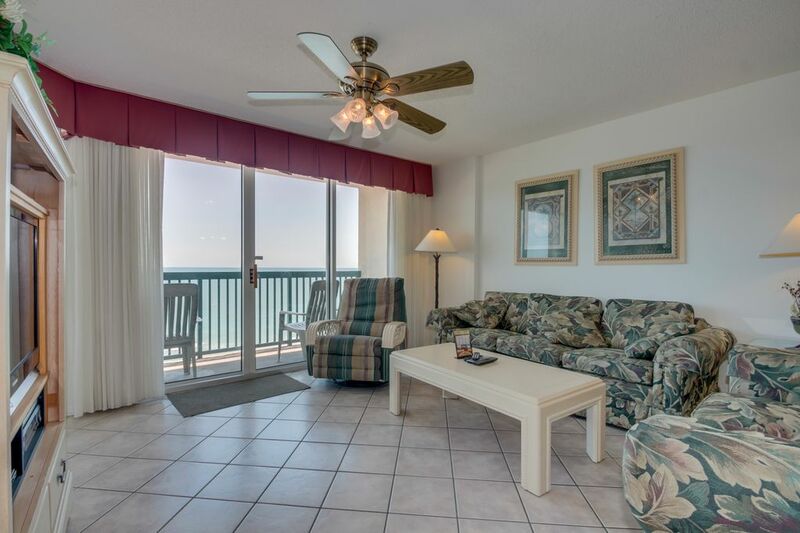 Oceanfront condo, Lazy river, indoor pool, hot tub, & picnic area onsite! Non smoking unit with 3 Bedrooms, 3 baths. Unit has 4 TV's (HDTV in living room), 3VCRs, 1 DVD, and 1 Blu-Ray. Complex has Lazy river, indoor pool, kiddie pool, hot tub and large picnic area. There is a king in the master bedroom, a queen in the 2nd bedroom, 2 twins in the 3rd bedroom and a sleeper sofa in the living room. Ashworth resort located at 102 North Ocean Boulevard is an 18-story tower in the attractive Ocean Drive section along the North Myrtle Beach oceanfront with all the comforts of home. Every vacation condominium at Ashworth features an oceanfront balcony so your family’s beach vacation begins with oceanfront views of our beautiful white, sandy beaches. Ashworth’s family-friendly recreational amenities include a pool deck with an oceanfront lazy river, oceanfront swimming pool, oceanfront kiddie pool and relaxing, oceanfront hot tub. Convenient parking in the multi-level parking garage at Ashworth makes parking a breeze. The Atlantic Ocean is just steps and invites you to rest and relax during your North Myrtle Beach vacation stay at the Ashworth. There is an on-site fitness center, indoor swimming pool and easy beach access will contribute to making your family vacation at the oceanfront Ashworth unforgettable. One thing that also makes this resort special is the oceanfront grassy area. If you don’t like the sand between your toes, try soft grass in the shade lying under the palm trees. North Myrtle Beach rewards you with oceanfront beach views, ocean breezes and delicious, local seafood. Family vacations in North Myrtle Beach mean oceanfront play time and smiles all around. This luxurious accommodation is located along Ocean Boulevard where beach clubs, boutique shops and beachfront fun are easily found. Free wireless internet access is a bonus for those who cannot bear to be without the Internet. This location was perfect, it was our first time in North Myrtle Beach and it was perfect, more family orinted and less touristy :-) I will defenitly go back, we liked everything on the outside of the facility, we loved that we could barbecue and all theother guets were great about a=taking turns. I would stay in this facility again BUT not inthis perticular one unless they change a couple of things: #1 -- the queen bed was horrible - sunken in-so not confortable at all : the tv was old school bad reception. #2 the bedspreads( yes bedspreads) so old and not confortable at all :-( -- not sure they clean them once a week :-( # 3 - no blankets on bed- just sheet and the horrible bedspreads #4 - we found blankets in a closhorrible they looked like they were from WW#2 :-( , hard and so itchy:-( #5 - no shades in the master bedroom -- so bright and sunny -early in AM, pretty but so hard to sleep late . -- there was enough supplies of dishes ,everything to cook with -enough towels for week, there was a washer and dryer which was a life saver. It was a very cleaned and well maintained property and freindly staff. elevators on check in day, were hoorible , it took 1 hour to get to use it, no satirs after 6th floor :-( to many people checking in at one time. alot to do around and plenty of shopping and dinning. We really liked the location of the condo, food, shops just a walk away right out the condo and added bonus...the Thursday street party! Condo fit our needs and was clean. Security Staff awesome. First time here with family we had a great time! Plenty of room for our family of 6. Maybe it was busy time of year but we had to wait past check in time for our room to be cleaned which wasn't done very well. Hot tub for adults only filled with kids with floaties. What is up with the parents? Lots of unsupervised tweens running around. Perhaps a quieter location for our family is best. Great location, nice accommodations and everything we needed. The condo and area were absolutely perfect for our vacation with my daughters and grandchildren. We had everything we needed and more. The management company was more than helpful. The only glitch was we couldn't get the DVD player to work in the living room. Even the maintenance man couldn't figure it out so that ruined "movie night". We will definitely be staying here again! !